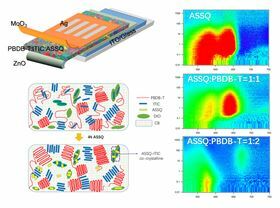 Top left: Researchers significantly improved the efficiency of an organic solar cell by introducing a squarine molecule (ASSQ), which both donates electrons and enhances the light absorption of the active layer of the cell. Bottom left: By making the ASSQ equal to 4% of the weight of the active layer, the nanotech researchers significantly improved its ability to produce current. Right: Photoluminescence spectroscopy depicts how energy is transferred between ASSQ and the polymer PBDB-T based on a selected wavelength; blue is the goal: it indicates energy absorption. Image: NYU Tandon. Organic solar cells have great potential as a source of clean electrical energy, but so far they have not been cheap, light and flexible enough for widespread use. Now, a team of researchers led by André Taylor, an associate professor in the Department of Chemical and Biomolecular Engineering at NYU Tandon School of Engineering, has found an innovative and promising way to improve organic solar cells and spur their use in various applications. Most organic solar cells use fullerenes, spherical molecules of carbon. The problem, explains Taylor, is that fullerenes are expensive and don't absorb enough light. Over the past 10 years, he has made significant progress in improving organic solar cells, and has recently focused on using non-fullerenes, which until now have been inefficient. However, he says, "the non-fullerenes are improving enough to give fullerenes a run for their money." Think of a solar cell as a sandwich, Taylor says. The ‘meat’ or active layer – made of electron donors and acceptors – is in the middle, absorbing sunlight and transforming it into electricity (electrons and holes), while the ‘bread’, or outside layers, consist of electrodes that transport that electricity. His team's goal was to have the cell absorb light across as large a spectrum as possible using a variety of materials, yet at the same time allow these materials to work together. "My group works on key parts of the 'sandwich,' such as the electron and hole transporting layers of the 'bread,' while other groups may work only on the 'meat' or interlayer materials," says Taylor. "The question is: how do you get them to play together? The right blend of these disparate materials is extremely difficult to achieve." Using a squaraine molecule in a new way – as a crystallizing agent – did the trick. "We added a small molecule that functions as an electron donor by itself and enhances the absorption of the active layer," Taylor explains. "By adding this small molecule, it facilitates the orientation of the donor-acceptor polymer (called PBDB-T) with the non-fullerene acceptor, ITIC, in a favorable arrangement." This solar architecture also uses another design mechanism that the Taylor group pioneered known as a FRET-based solar cell. FRET, or Förster resonance energy transfer, is an energy transfer mechanism first observed in photosynthesis. Using a new polymer and non-fullerene blend with squaraine, the team were able to convert more than 10% of solar energy into power. Just a few years ago this was considered too lofty a goal for single-junction polymer solar cells. "There are now newer polymer non-fullerene systems that can perform above 13%, so we view our contribution as a viable strategy for improving these systems," Taylor says. The organic solar cells developed by his team are flexible and could one day find use in electric vehicles, wearable electronics and backpacks for charging cell phones. Eventually, they could contribute significantly to the supply of electrical power. "We expect that this crystallizing-agent method will attract attention from chemists and materials scientists affiliated with organic electronics," says Yifan Zheng, Taylor's former research student and lead author of a paper on this work in Materials Today.